Adding a room to the back of the cabin. This part of the construction was more traditional. This room has 2x6 framed walls. It measures 16' across the back of the cabin by 12' deep. It houses a small 9x12 bedroom and a full 6x12 bathroom. Unfortunately, I must not have taken very many pictures through this process. So I'll try to describe the process. 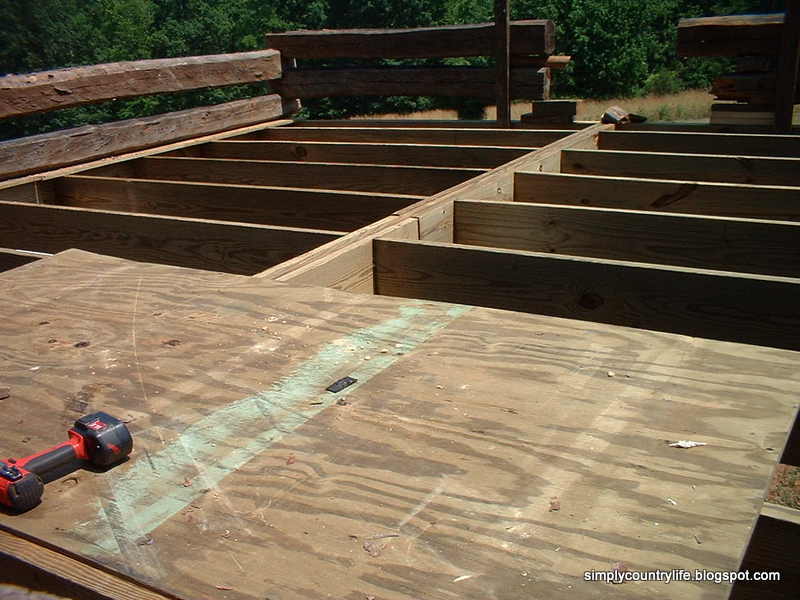 We built the floor joist system, just like we did in the main part of the cabin, by building the rectangle framework first, then attaching board stringers every two feet inside of the frame. Next we cut smaller two foot pieces to run in between the stringers to help add strength and to keep them straight. This is an important step because when you attach your flooring on top of them you will know that the stringer boards are exactly two feet apart and that the boards do not bow or curve. We were able to easily attach the sheets of subflooring over the flooring system. Here's a pic of the floor in the main part of the cabin to give you a better idea of what I'm trying to explain. Once the floor was built and attached to the back of the cabin and level, we were able to start building the walls. The wall framing is similar to the floor. We built a rectangle framework first on the ground and attached 2x6 boards vertically inside of the framework every two feet. Then we would pick up the entire wall frame and attach it to the floor. We made three walls like this because we are using the back log wall as a focal wall in these rooms. Once all three walls were securely attached and square we wrapped them in Tyvek house wrap to help provide a moisture barrier. Once the walls were wrapped we covered the outside in sheets of exterior grade T111 and added battons (the skinny vertical boards) to give the walls some depth and character. Then we proceeded to build the roof. We used the beams that supported the top floor of the original cabin as exposed rafters in the bedroom portion of this addition and standard 2x6 boards as rafter beams in the bathroom portion. The interior ceiling has T111 attached on top of the rafter beams, to leave the beams exposed. The roof was built up from there and insulated and covered with roofing tin. The additions exterior structure was almost complete at this point! We installed windows, one in the bedroom and one in the bathroom. We didn't put any windows on the back wall because it faces directly into the woods. All that was left was to stain the outside with the stain mixture we used on the rest of the cabin. We painted on a couple of coats of this protective stain and going into the early winter of 2009 we have completed the exterior structure of our cabin!!!! We were super anxious at this point to get the stonework on the chimney done so that we could take a step back and admire everything that had been accomplished so far. We were so anxious to get it done, we actually hired a neighbor who specializes in stone work to have his company do it for us. My husband is deathly scared of heights and it seemed worth it to him to have someone else tackle this project. They covered the chimney and the cinderblock foundation pillars in stone. They did a wonderful job and it only took them 2 days! Looking back, this took just over 1 1/2 years of laboring on weekends and nights and tackling projects as funds would allow. Sometimes, you have to look back at what you have accomplished to help motivate you to keep moving forward. We were halfway there and soon we were going to be able to start creating and bringing the inside of the cabin to life. To me, that seemed like the fun part! If you would like to look back over how we got to this point and follow along with our progress go HERE.